Home » Alison Gallant » Polydays 2012 – can we do it all again? Polydays 2012 – can we do it all again? Wow what a weekend! I had the best time! I learnt some new skills, I bought some new tools, I met some new friends,I had a great time with some of my favourite polymer people. I really didn’t want to come home! I was a bit worried before I went as I have been having pain in my arm and wrist. Amazingly it got better whilst I was away so I need to do more clay at home too! It turns out it’s tennis elbow and using the computer makes it worse, as does writing and driving. 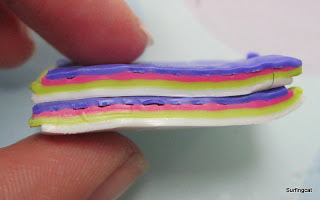 Thankfully most polymer clay things are ok! So if I am a bit quiet online for a while please excuse me. Anyway you will want to see what I made I am sure! We had three workshops – each one lasting a day. One with Bettina Welker where we made her clever hinged bangles. They take a while to make but are worth the effort – giving a snug fit around the wrist. I went for a purple and teal bangle. I was also able to buy a copy of her new bracelet book – oh I can’t wait to try some more bracelets and bangles – thank you Bettina!! 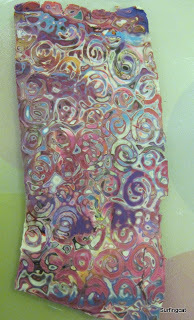 Then we had a metallic mokume gane workshop with Carol Simmons. Her work is amazing, it has so much depth to it. I am pleased to say she taught us the secret of that! We also got to use her amazing slicing machine. We made imprinted blocks of mokume gane using Carols handmade texture sheets then sliced lovely even thin layers using the slicing machine. If you want to see the machine go check out Carols blog. The colours of clay and the wonderful patterns turned into some beautiful lentil beads. 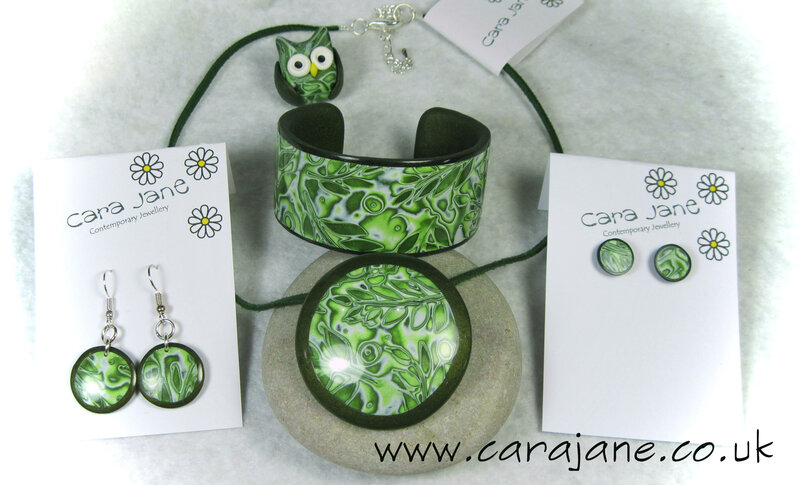 Carol also had a clever mould for making these. The other side of the lentils. On the last day we did an overlapping lentil workshop with Alison Gallant. She showed us many other techniques including silk screening. The necklaces are reversible which is pretty cool. One side is black with silk screen printed white dots. The other is made by cutting a bullseye cane with a ripple blade (thanks to Irene for the inspiration on that one). Notice I made a co-ordinating little dangle as well. 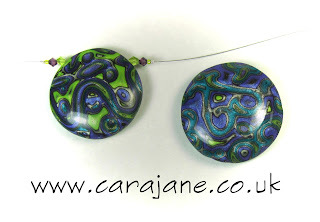 I also made a new pendant in between doing other bits – to match my new hinged bangle. It was a truly blissful weekend. Thank you to Alison for organising it, to the wonderful tutors for sharing their amazing skills with us and all the other participants for making it so much fun! Oh and a big thank you to Penny – www.clayaround.com and Valerie and Craig – www.polymerclay.co.uk for bringing all your wonderful supplies for us to buy! Can’t wait til the next one!!! It was fabulous, wasn’t it! Roll on next year…..